Okay, I disappeared there for a bit. Sorry about that. I began writing this blog entry two weeks ago and then kept getting sidetracked with the rest of my travels, a cancelled airplane ticket that delayed my trip back home and then a lot of catching up on sleep and catching up with friends and family. Although I write the blog to be read, I am always surprised that people actually do look at it, so for those of you who do — I’m sorry to keep you waiting. I’m safe, I’m back in Toronto and I had a lovely rest of my time in Vienna and in England. I didn’t do very much in the last two days in Vienna except walk around the city and manage to fail to do a bike tour (twice). The bike tour company offered a guided tour in the morning and another that covered different parts of the city in the afternoon. Based on the descriptions, the morning tour was more interesting but I couldn’t get out of the house in time to do it (my persistent cough made sleeping difficult and so I stayed in bed later than usual). The tour operator’s office was in another part of the city several subway stops away from Leon’s apartment. I figured I’d take the train out there in the morning, register for the afternoon tour, wander around this new area of town, have a quick lunch (I didn’t have breakfast) and then take the tour. Sounded reasonable. 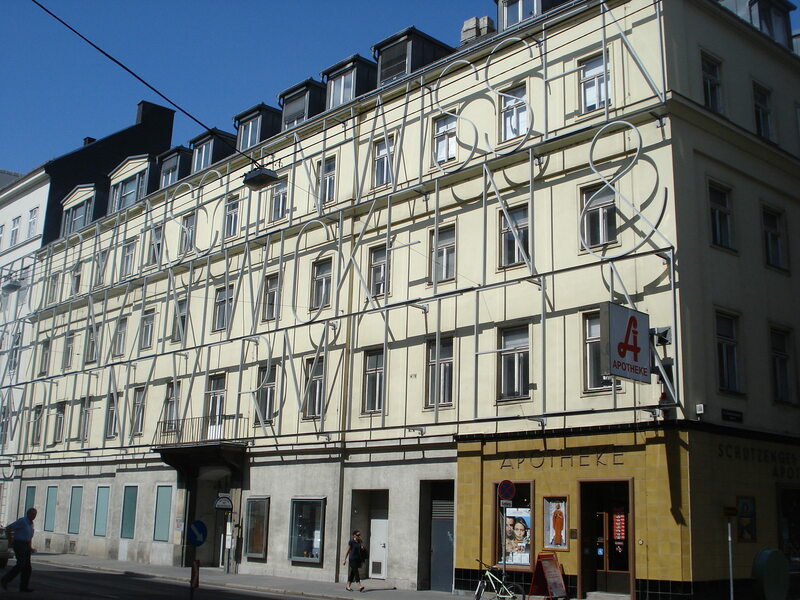 Unfortunately, when I got out of the station, the neighbourhood was nothing at all like the Vienna I’d come to know in the previous few days. It was kind of like Don Mills and York Mills – wide, green, function-over-form industrial-complexy kind of buildings with very little happening on the ground, especially in the punishing heat. I walked the wide treeless sidewalks and got a little bit lost and a lot sweaty. I eventually found the bike place whereupon the bike mechanic said that there was actually another office in the centre of town (just a few blocks from Leon’s place!) and that’s where I needed to go. Sigh. On my ride back into the city it was amusing to watch people on the subway. To open the train doors you have to press a button on the side. So many people impatiently pressed the button while the train was still moving in the tunnel. It’s just like people with elevator buttons: they impatiently press the button five-six-seven times as if that will make a difference in the speed with which it opens. I would have loved for a door to spring open in the middle of the tunnel some time, just to see how people would react. By the time I got into town it was too late to eat AND do the bike tour. I knew I wouldn’t have the energy to bike if I didn’t eat, so I opted for eating and walking. I was happy to be back in the pretty part of the city. I love the architecture here. I love that most buildings are about six storeys tall. It makes for lots of sky and a feeling of manageability. There are also these funny newspaper dispensers around the city. 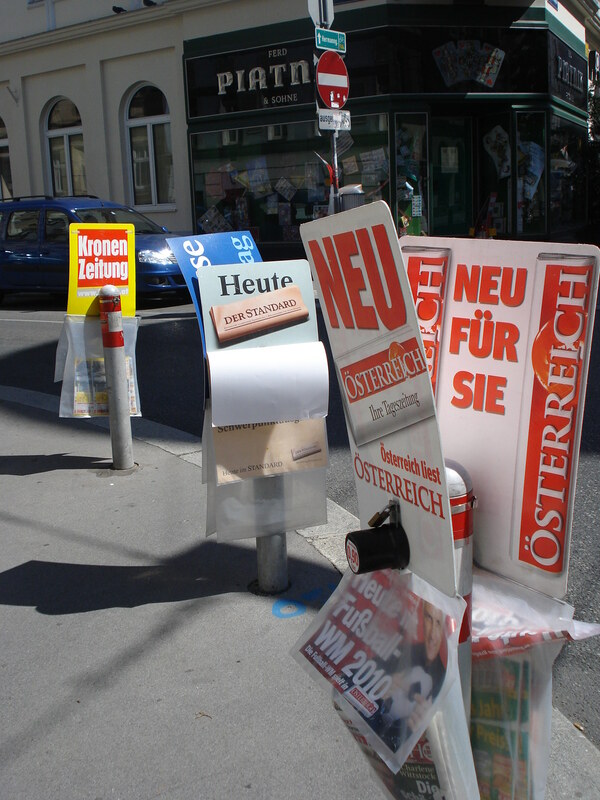 It made me think that Austrian papers must be very thin, or else the plastic wouldn’t be able to hold the weight of more than three copies. The beautiful ceiling at the entrance to... uh, something. This building has words mounted on the outside in strips of metal but the play of light and shadow meant I couldn't read it. 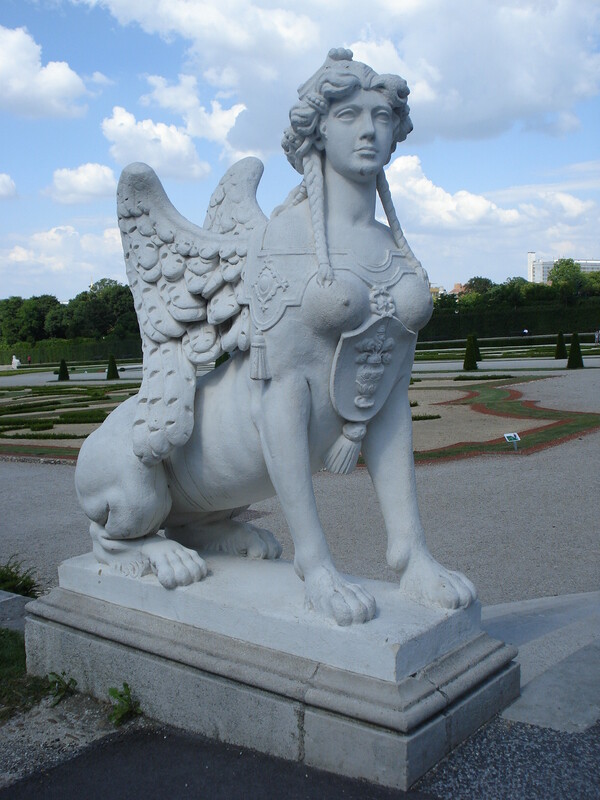 A statue inside the Belevedere. The breasts throw me off. I had hoped to try some sacher torte on this trip — it’s an Austrian specialty. Unfortunately, it goes best with the other Austrian specialty, coffee, and since I’m not a coffee drinker and tea here leaves much to be desired, I ended up missing out on this bit of culture. On Monday evening Leon and I went to the Naschmarkt to eat. We were both impressed with the liveliness of the space on a Monday evening — it was packed! — and also by how the market transforms from fruit and meat stalls to open air cafes in the evening so seamlessly. After our lovely meal, one of the World Cup games that included Brasil was playing at another outdoor cafe in the market. We decided to watch there. After being yelled at by a woman when I asked if I could take the extra chair at her table, (“NEIN!! NEIN!!! NEIN!” she hollered after I misunderstood her and began lifting the chair) Leon and I sat at the next table and were joined by Philip, a lovely, funny Austrian fellow who had offered us his spare chair. After the game, the three of us went to Kunsthalle cafe (which has an art gallery that was showing Marilyn Manson’s paintings; yes, they are as creepy as you’d think they’d be) and we had more drinks. The Austrians are not the most friendly, warm people you’re going to meet, but all of the ones we got to know were super nice. On Tuesday, I walked around some more. 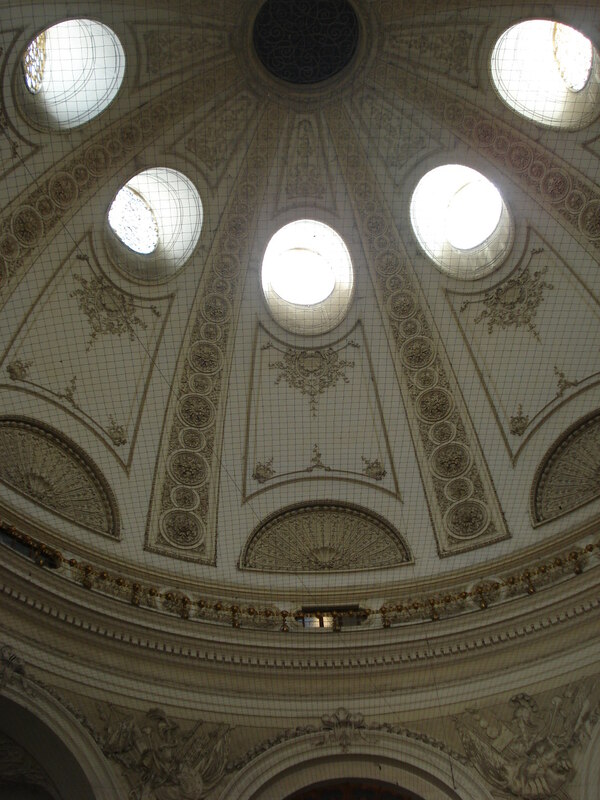 Vienna has several amazing museums, none of which I saw from the inside. The weather was just too beautiful to spend time inside and exploring a museum by myself isn’t that interesting to me; who can I turn to to mock or marvel at the art? So on this day, I explored the Stadtpark, a pretty park in the middle of the city. It was a lovely location for a picnic. I had neither a blanket nor food so sat on a park bench like a stalker staring at the people who did have blankets and food. In the evening, I met up with MNAB (my new Austrian boyfriend) at the same Kunsthalle cafe that I’d been to the night before and we had a lovely evening. We were joined by his best friend, who was super nice, and then went for dinner at a Japanese restaurant. After dinner, we decided to watch that night’s World Cup game and more of his friends joined us. All of them were super. 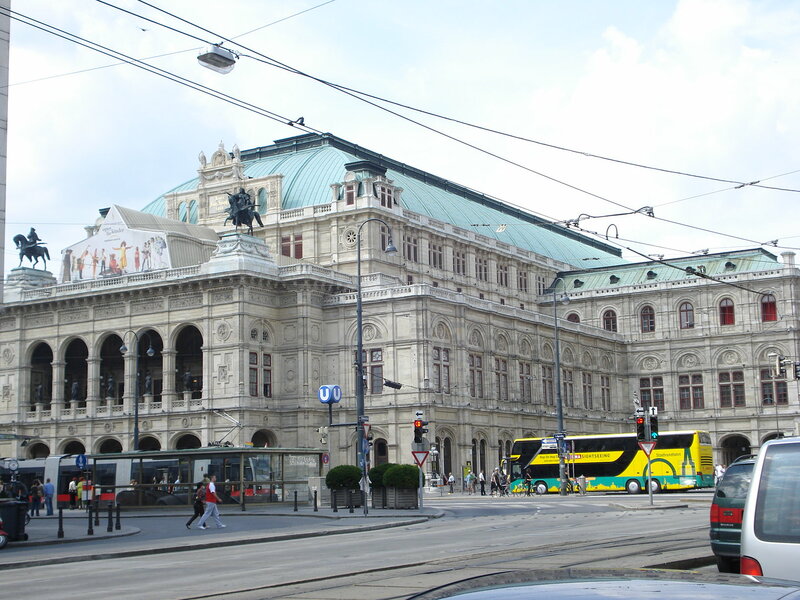 I had so much fun and was disappointed that my time in Vienna was already at an end. I would definitely go back. Stay tuned for the next adventure. I don’t know where or when that will be, but I’ll definitely write about it when it happens. Cheers! I have lost my genius. See, I’ve moved around a fair bit in my life and I’m a genius packer. Seriously… total genius. But as I packed to leave Nice, my suitcase, which theoretically contains less than I came with (I only bought shoes in France and I sent a big box of things home through the mail), was overflowing. And, man, was it heavy—four pounds overweight, the woman told me at the airport. So I was the girl rooting around my open suitcase on the floor of Terminal 1 deciding what to throw out. Bye-bye full bottles of lotion and expensive hair products, so long leather-bound notebook. When I had removed the four kilos necessary to get me to 20kg, the woman behind the counter asked kind of accusingly, “What did you do with everything?” I told her I threw it out and she apologetically told me I could have gotten away with tossing only 1kg. Great. Thanks for telling me NOW. So now I’m in Vienna. It is a BEAUTIFUL CITY. Beautiful in a different way than Nice – bigger, cleaner (I don’t have to watch for dog poo! ), vast open green spaces, and more, um, Austrian. 🙂 Leon’s apartment is PERFECT. Seriously, it’s my ideal home, bright with 12 foot ceilings, big windows, spacious but not too big and it has a guest bathroom. I could totally live here. I’m having a bit of a Sri Lanka flashback though as it would appear that there are only about four other black people in Vienna (probably also tourists) so I get lots of stares. My hair is also a bit crazy at the moment (a problem that will only get worse since I threw out my hair products 😦 ) so that might contribute to the looks. 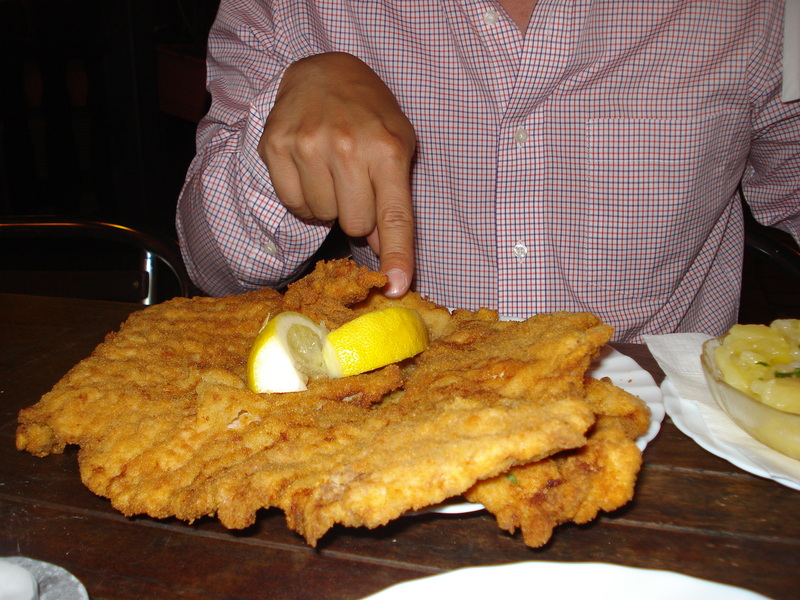 There's a plate somewhere under that schnitzel. We did a pretty good job of making a dent in both dishes but it was a slog. In general, Leon and I weren’t particularly impressed with either dish, but I was glad we’d tried it. Afterward we walked to a nearby bar. People still smoke in bars and restaurants in Austria, which I find so bizarre for a city that seems otherwise very, very progressive. (The streetcars are flying rainbow flags and the parks have big water fountains that encourage people to refill their bottles and reduce plastic.) There were a pair of 15/16 year olds sitting at the table next to us enjoying a beer, so I’m curious what the drinking age is here. On Saturday, we started the day at the Naschtmarkt, which is a giant outdoor market much like St. Lawrence. We bought flowers and supplies for dinner. I had the cutest exchange with one of the cheese vendors. I asked for Emmenthal in English and she pulled out a piece and asked if it was okay. I said “oui, merci” (I keep accidentally speaking French here) and she was thrown off. She asked if I was French. I explained that I speak English but I’d just come from France and keep mixing the two up now. Her coworker then said “French people don’t speak English very well.” And the girl serving me said, very proudly, “But I can English.” Her coworker looked at her and said sarcastically, “You. Can English?” and then the girl realized that she’d forgotten a critical word and said, “I can… SPEAK English!” and jokingly pushed her coworker away. We all laughed. It was cute. 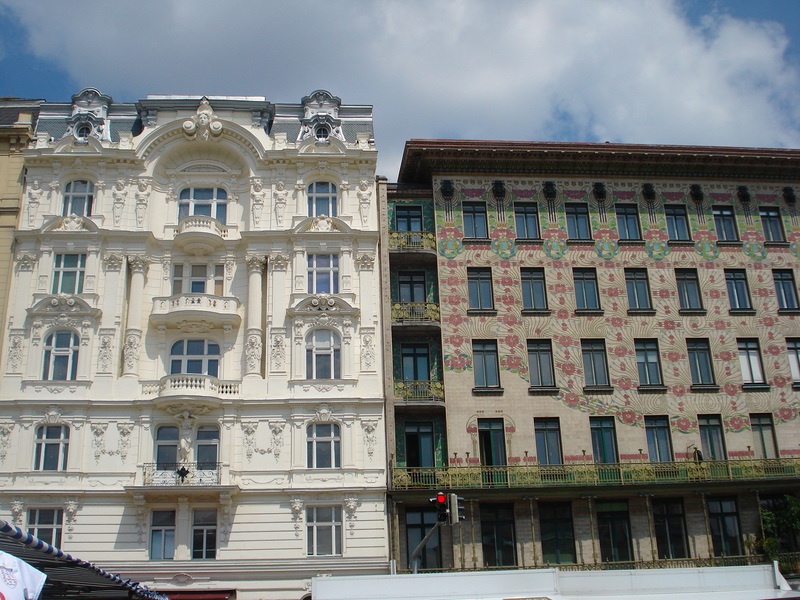 A couple of buildings next to the market. Kartnerstrasse was packed with tourists and reminded both of us of the Eaton Centre, except outdoors. We went to St. Stephen’s church, which is a 15th century structure, but there was an important funeral with lots of media outside snapping photos outside so we were only allowed into the back of the church. After wandering all over the museum quarter, we headed back home, where Leon made an awesome chicken dinner and we watch the U.S. lose to Ghana in the World Cup. Next: dancing. 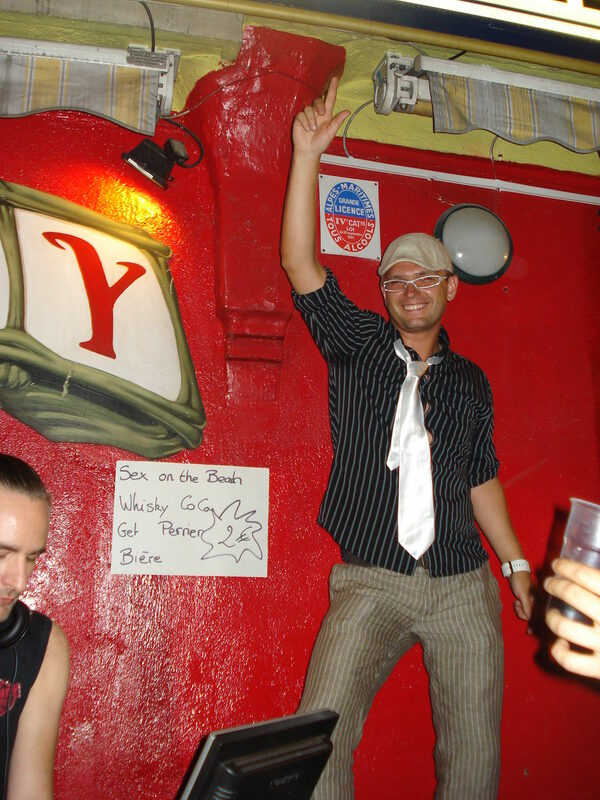 We headed to Heaven Vienna, a gay night at a bar whose name I don’t remember. It wasn’t particularly good or busy. Donauinselfest (Danube Island Festival), which is the largest music festival in Europe, was taking place this weekend so people were saying that it might affect club attendance, but that the club generally didn’t get busy until 1:00 or 2:00 a.m. Leon and I decided to leave because even if it did get busy, the music was uninspiring. Outside, we pulled out our map to see how to get home and this ADORABLE young guy came up and asked us if we knew where Heaven was. We showed him and then decided to go back. We ended up hanging with him for the rest of the evening. His name was Jonathan and he was from Luxembourg. 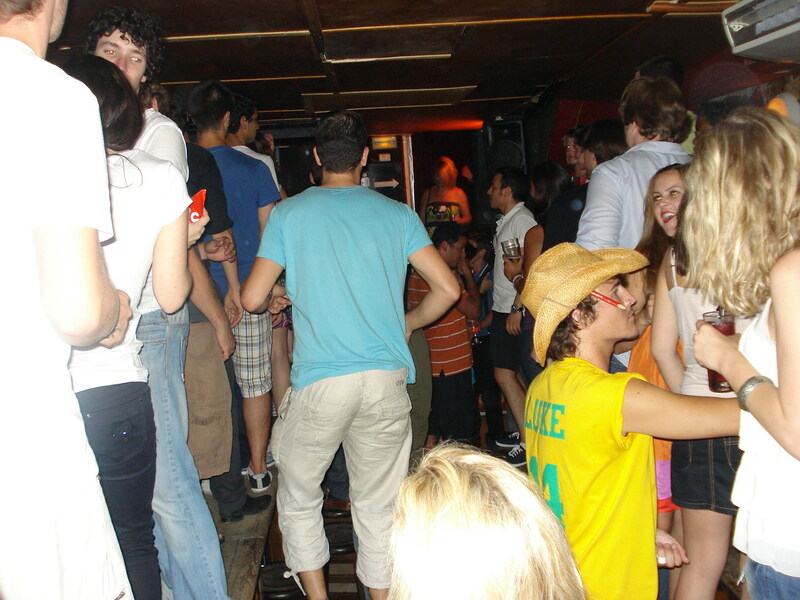 The music didn’t get any better but the club did get busier and it turned out to be a fun night. We were slow getting started on Sunday but eventually got out in the early afternoon. 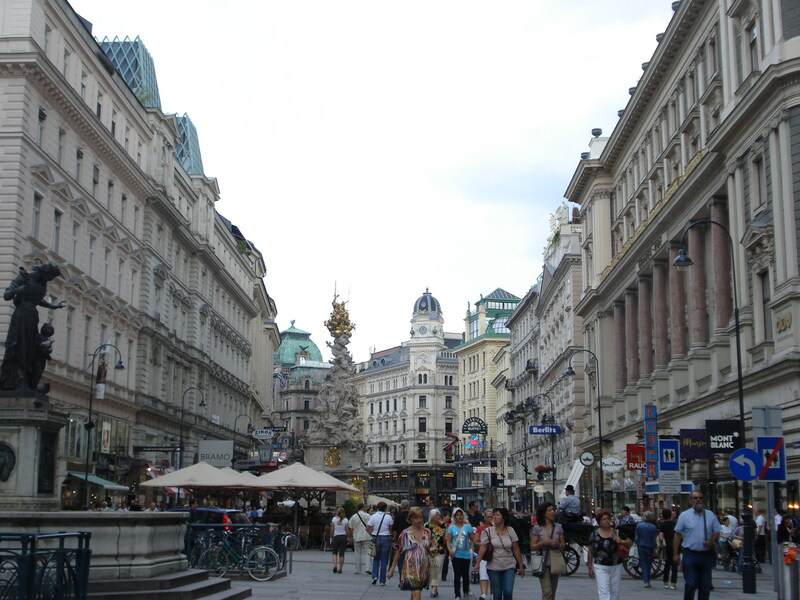 We wandered the city and discovered that Vienna is basically deserted and closed on Sundays. We finally found a cool restaurant called Freiraum and had a lovely lunch there. 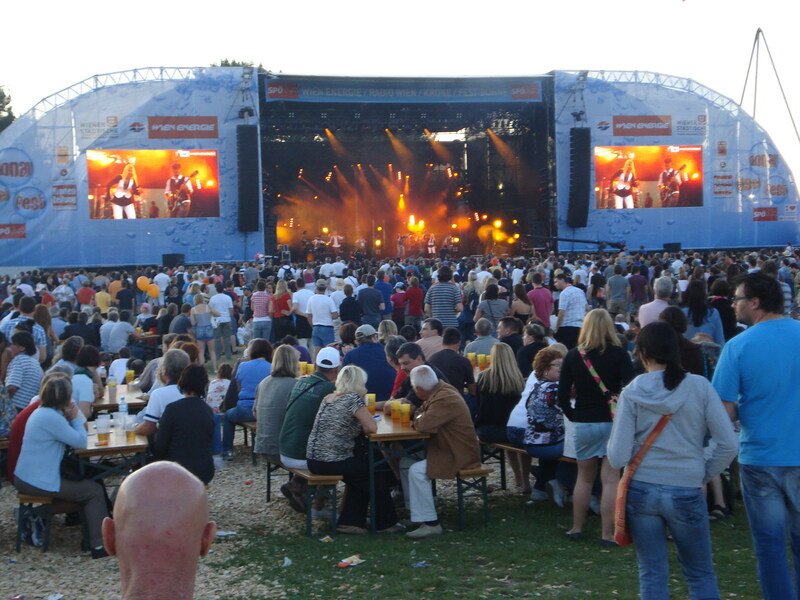 Then we went searching for a place to watch the England v. Germany football game. We passed a group of guys who were speaking English and looked like they might be soccer fans so I ran back and asked them where they were going to watch. They explained that they were taking the subway to this place where there are lots of screens. Leon and I decided to go there too. It turned out to be this building that had a massive courtyard in the middle (so massive that there was another building within the courtyard and still lots of room in the courtyard. It was like an enclosed beer garden. It was packed with people and there were big screens everywhere as well as an auditorium in the middle building if you wanted to watch indoors. As Leon and I tried to choose our spot, a guy waved at me and said hi. 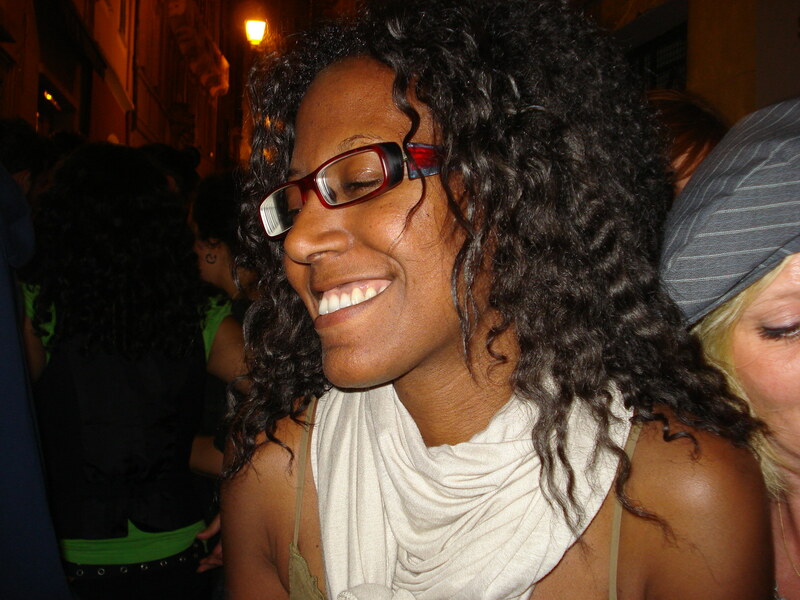 I assumed he thought I was someone else (perhaps the only other black girl in this city. 🙂 ) From the cheers, he and his friends were England supporters like us so with each successive German goal, we’d look at each other and shrug. After England lost horrifically (4-1) he came over to us and started chatting. His name was Raoul and he was really nice, and his friends Christoph and Franz joined us and we all chatted for a while. 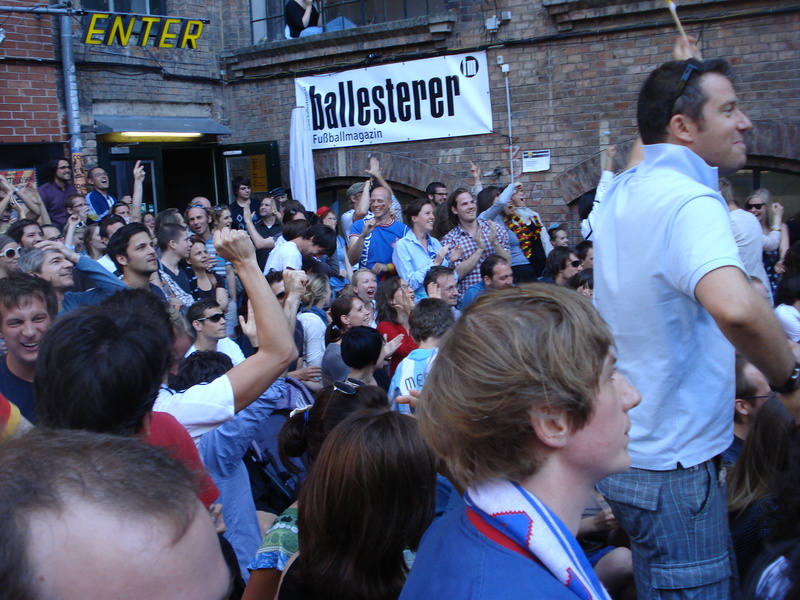 The Austrians celebrate a German goal. Except the guy in the foreground. He was rooting for England. 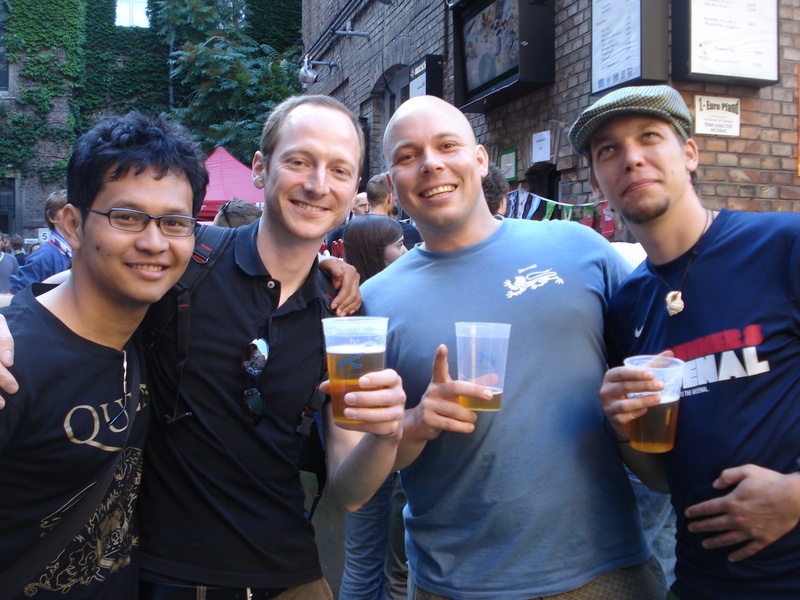 Right to left: Raoul, Christoph, Franz and the friend that disappeared. They asked what we were doing next and we said we didn’t know. Next thing you know, we were all going to the music festival on the island together. 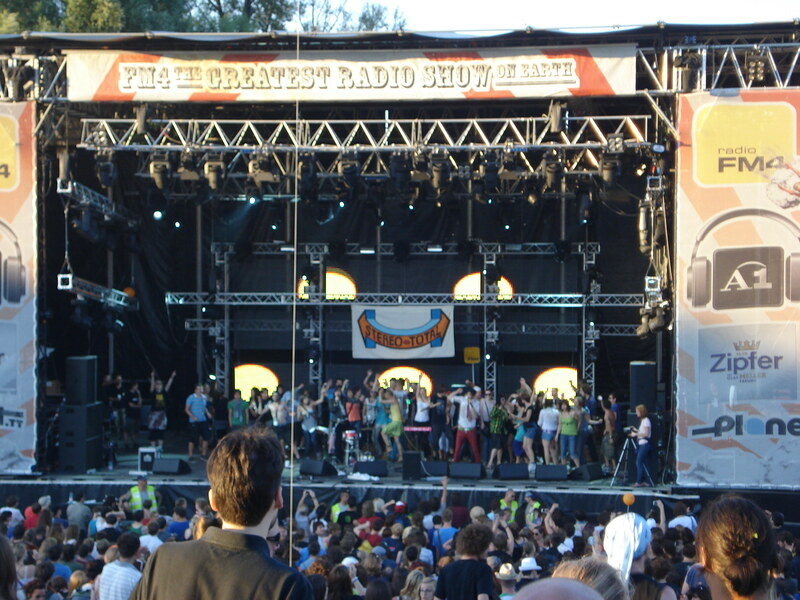 The festival has 12 or 14 stages all over the island. We ended up at a stage with a two-person band playing electro-pop. I was surprised when we got in sight of the stage that the lead singer was a woman in a business suit. She apprently had a French accent when she spoke in German, according to the boys, and they said it was fake because she wasn’t French. It was goofy music and we danced around as people do at a music festival. 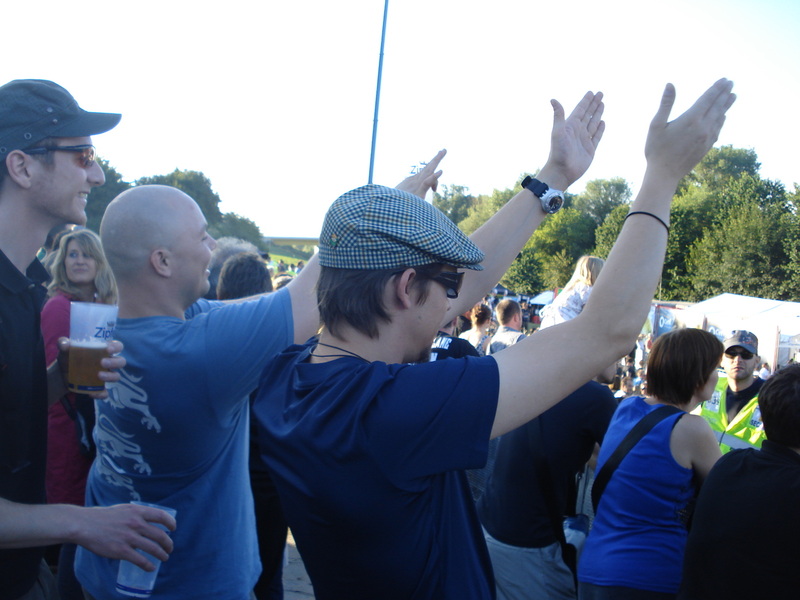 Christoph and Raoul do some synchronized dance move. Another of the stages we passed on our way out. Today is my last day here and my first full day of vacation. I finished my environment essay on Wednesday, Thursday was my last class at Alliance Francaise and today is the first day when I have absolutely no demands (except to pack my suitcase and clean up the apartment a bit). It’s a strange mental space for me to be in. Uncomfortable and restless-making. I’m someone who is used to juggling multiple tasks and to have no tasks at all is bizarre terrain to traverse. Then, the man beside her said, “Madamoiselle… mademoiselle…” and I realized he was speaking to me. I turned and he handed me a German flag, much to the delight of the others in the bar. It was a big flag and I didn’t know what to do with it (especially since I was kind of hoping Ghana would win because I thought it would be nice for one African country to advance when the Cup was being played on their continent for the first time.) I kind of held it and rested it on the table. My dinner eventually arrived (which was surprisingly delicious) so I gave the flag back to the man to make room for it on the small bistro table. After Germany scored, every 10 minutes or so he would ask me if the game was to my liking. I said yes and then said in French that it didn’t really matter to me who won. I later discovered that he doesn’t speak French so he didn’t probably understand what I said. Germany won the game (although both Germany and Ghana advance, so I was happy), and the group in the bar was delighted. They invited me to join them as well as some young German girls who had come in partway through the game and then they bought a round of drinks for everyone. I was wondering if this kind of thing happens in Toronto. I never go to bars/restaurants on my own there (nor have I really ever noticed anyone eating alone there). Would I would be invited to join a group in Toronto? Would I invite someone to join my group? I want to try this when I get back. It’s the second time it’s happened here, and in general I feel that people are just more chatty with strangers in Nice. It turns out that the young girls were scouting locations for a film they are making and they were returning to Austria the next day. 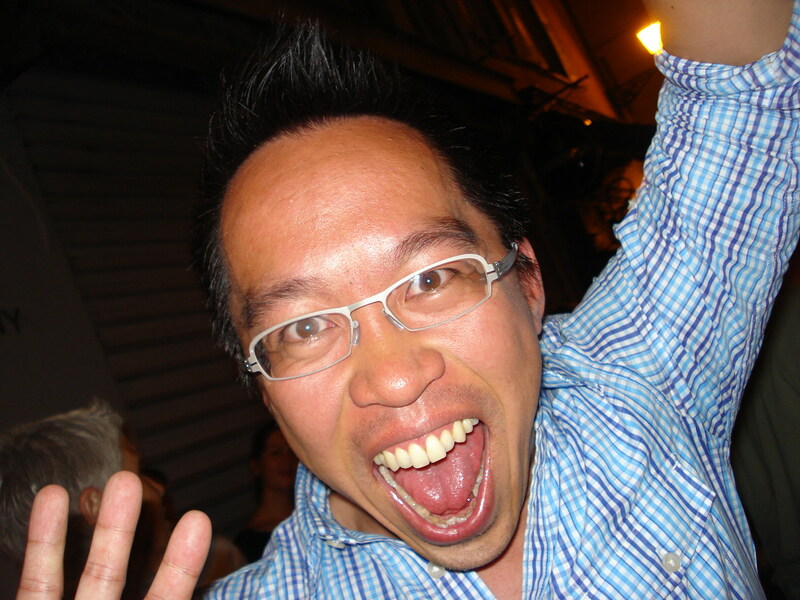 I told them I am going to Vienna and they gave me their email addresses and said we should meet up there. So nice! 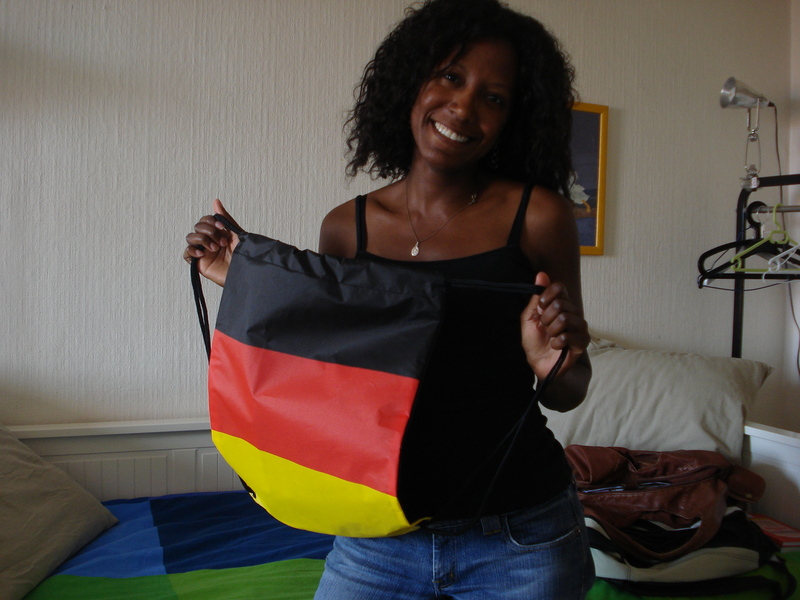 As a parting gift, the group of Germans gave me this beach bag/knapsack thing in the German flag’s colours. Too funny. Me and my souvenir of the evening. Yesterday, I just ran errands after class and met up with Lina and Denise (classmates) to watch the New Zealand vs. Paraguay game and Italy vs. Slovakia game, which were on at the same time. 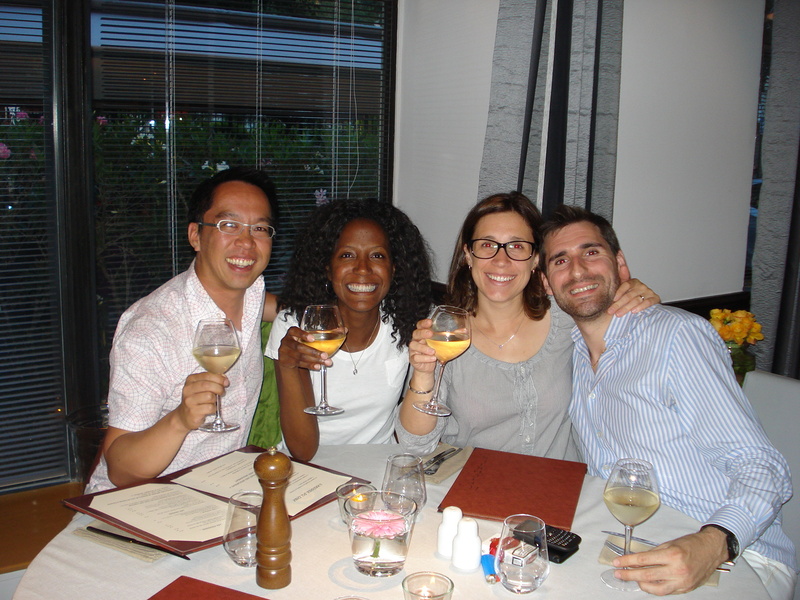 Denise is from NZ and Lina’s boyfriend is Italian. Both teams risked elimination if they didn’t win and also needed to do better than the other to advance, so Denise and Lina were quasi-rivals during the games. Neither of their teams won, so both are out, but it was fun to watch with people who reeeally wanted the teams to win. After the game we went to the same rooftop bar that I’d been to with Leon, Florent and Florence. It was lovely again. Denise and I apparently find something VERY amusing on the roof. Denise and Lina, looking much more composed. I had run into my landlady in the morning and she said she was having friends over that night and invited me to join them for dinner so I had to leave the bar a bit early and head home. Dinner was nice—a simple chilli—but I didn’t understand as much of the conversation as I’d have liked. There was a lot of talk of French politics and ironic banter and in-jokes, most of which had to be explained to me. Still, I’m glad I went just to sharpen my ear a bit as I head off. Au revoir, Nice. Bonjour, Vienne. Jetzt muss ich Deutsch lernen. Yesterday was a great day. We have a bunch of new women in class who all seem nice (and, strangely, all remarkably pretty). It’s funny how the vibe in the class changes with each new addition. I feel that we’ve entered a good phase with the latest batch so it’s a shame that I won’t get to know these new girls since tomorrow is my last day at Alliance Francaise. I can’t believe this is my last week! Le sigh. By the time class finished, Leon had decided that he was happy to stay in Nice and my wallet and I breathed a sigh of relief. Instead of forking over $60 each, we put together a picnic lunch and headed down to a park near the water. On our way, we bought some delicious cheeses, crudités and wine. I already had paté and cornichons (these delicious little pickles that I’ve grown addicted to) and Leon had two types of homemade sausage that he’d bought on an organic farm near Tombeboeuf. 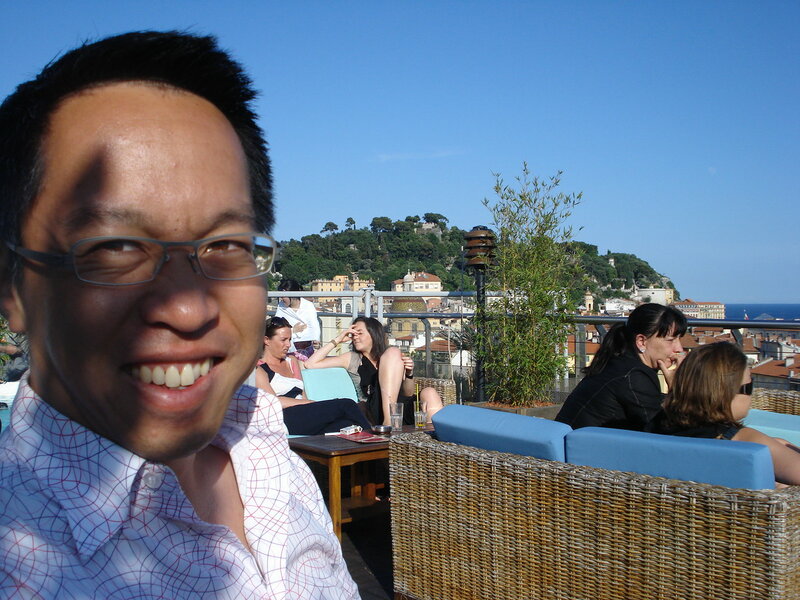 Picnicking in the warm sunshine on the French Riviera is pretty sweet and I was happy to be in the company of one of my closest friends, stumbling through my French and indulging in delicious foods. Life is pretty darn good. 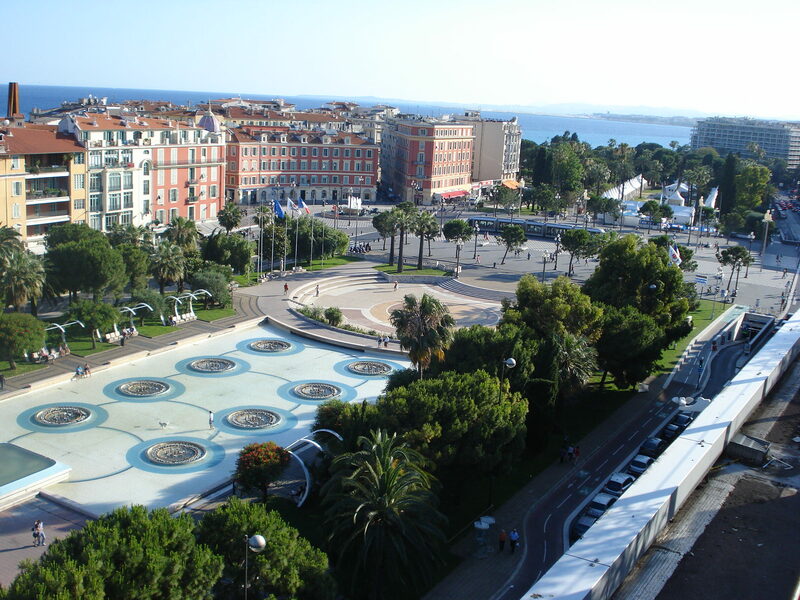 A view of Place Massena and Promenade du Paillon from above. Florent and Florence were soooo nice! I really liked them. We had a couple of apperatifs each and the two of them and Leon babbled away in French while I sat mostly mute. It’s funny, I have several first- and second-generation Canadian friends and they would often say to me “I can understand [insert parents’/grandparents’ language here] but I can’t speak it.” I never really understood that. I always thought the two went hand in hand. If you know the words well enough to comprehend, you must know how to say them back to people, right? Well now I understand. I could follow about 80% of what was being said but my mind would seize up if I had to say anything back. It takes me a long time to search for the words and I just want to be able to speak normally, fluently and quickly… so I don’t speak at all. It is very frustrating – I feel like I’m going backward. Not exactly what you want when you’re about to re-immerse yourself in English-speaking culture. Oh well. Florent suggested we go to dinner together and Leon and I gladly obliged. They took us to a restaurant called Les Epicuriens and it was FANTASTIC. It was another family-run restaurant in which the waiters were the sons (and were cute. Oh, those broad shoulders…. sigh.) The owner, was really kind and chatted with us about wine and seafood. Everyone’s meal was amazing and if I was staying here for another month, I’d definitely be taking people there. I recommend anyone who comes to Nice check this place out (the address is 6, place Wilson). The whole evening was lots of fun – delightful company, delicious food and once again that sense that I’m welcoming new people into my life while embracing the ones that are already there. 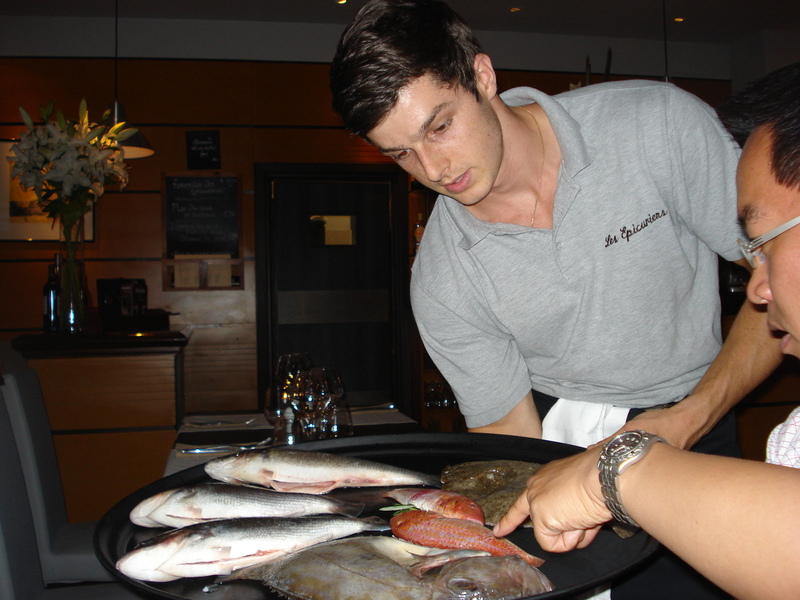 The waiter explains the various fish that are on the menu. The four of us pose (photo courtesy of the lovely owner). 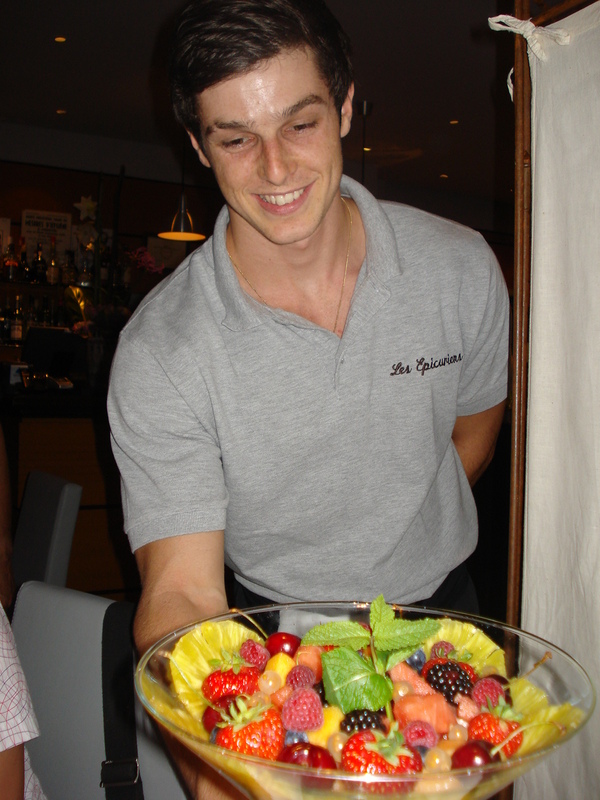 Our waiter presents our giant fruit bowl dessert. Aaaaand, I don't know what exactly is happening here. No, not that kind of quickie. After putting his stuff in the apartment and getting organized, we headed out for dinner. 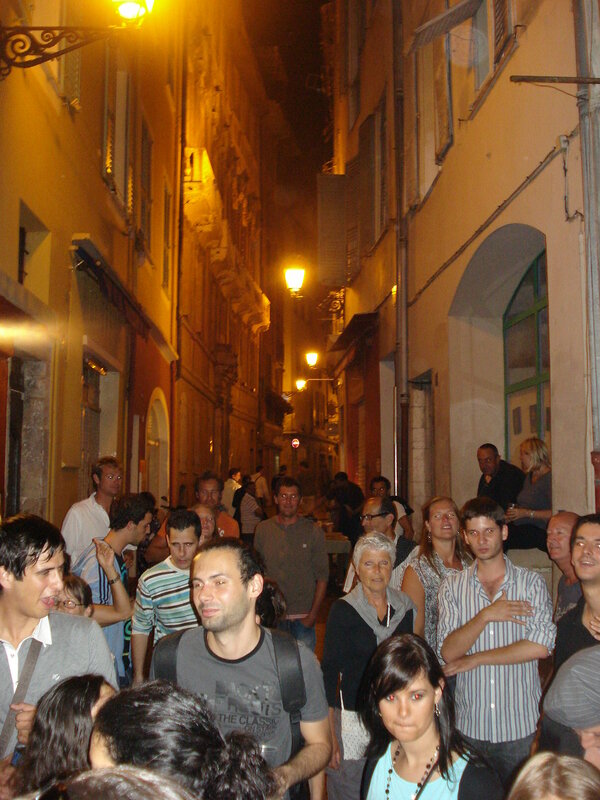 We got to Vieux Nice (I decided to try the restaurant that rejects us one more time) and it was crazy busy. It is usually full, but it seemed more animated than usual. When we hit one of the squares, there was loud, rhythmic drumming. We wandered over and it was just a drumming circle but I suspected that it was part of the Fete de la Musique here in Nice. There have been signs about la fete but I thought it was happening next week, but everywhere we went, there was music playing. We went to the restaurant, which was full, but they said if we came back in half an hour they’d have a table for us. Turns out the hot waiter has a brother who is even hotter so Leon was quite pleased with our dinner venue choice. 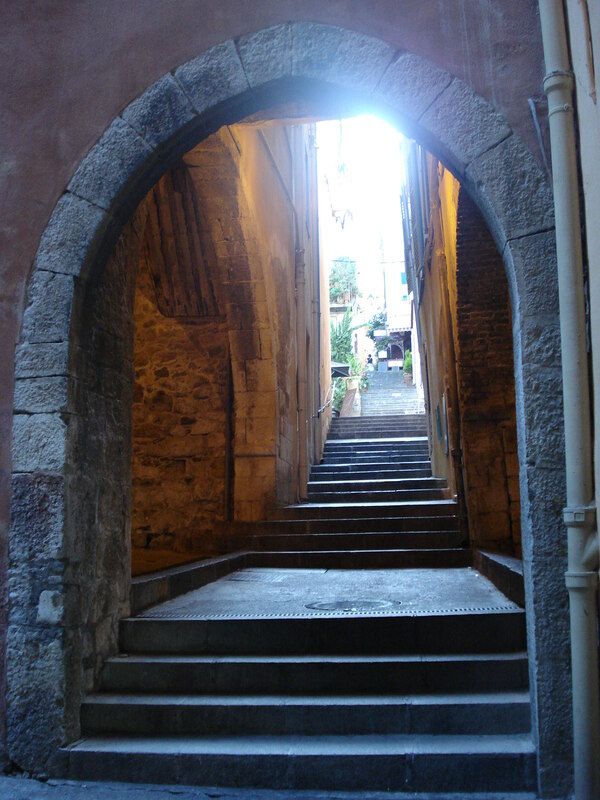 We had an apperatif at a nearby bar and then returned for our meal at Acchiardo. It was good meal, but nothing spectacular after all that effort. After dinner, we wandered around and the streets were crazy alive. We stumbled onto a quasi rave and joined in the dancing for a while. Then we went to get Leon ice cream and got separated in the crush in front of a live band in front of Wayne’s. It was crazy but great and I loved that it was all happening on a Monday night. After perching myself on a chair so that I was head and shoulders above the crowd, Leon spotted me and we were reunited. We wandered around a bit and then headed home since my coughing had kept me awake most of the night before and I had to be in class in the morning. Part of the impromptu party we stumbled upon. I get caught up in the music. Aahh drinking in the street... so civilized. I shouldn’t have let this many days pass since my last entry. It’s hard to remember stuff. 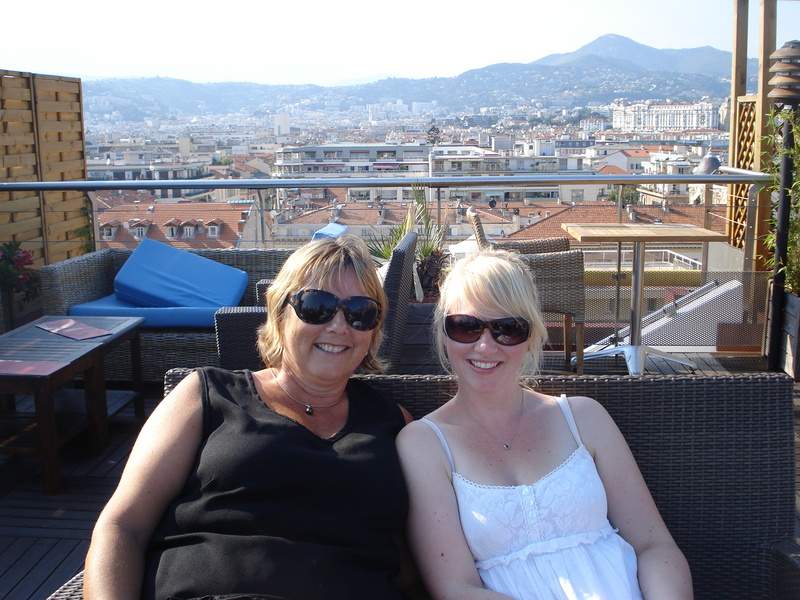 This is my last week in Nice and the time seems to be flying by. On Thursday I decided I would go to the Matisse museum after class, but when class ended, some of the girls asked if I was going to join them for lunch. Our teacher had suggested a restaurant a few weeks ago and we have had no luck getting in on two previous dinner attempts so they thought we should try lunch instead. It was a lovely day and I needed to eat so I figured I could go to the museum afterward. When we met up half an hour later at 1:30 p.m. at the restaurant, we were told that it had finished its lunch service and wasn’t opening again until 7:30 p.m. Honestly, we are cursed when it comes to this place. I actually think the young, handsome waiter enjoys rejecting us. He’s always very apologetic but I sense a hint of glee behind that finely chiselled exterior. The four of us, Lina (from Sweden), Denise (from New Zealand) and Lisa and I (both from Toronto) went to another place that Denise had enjoyed the day before. We sat out on the patio in Place Garibaldi, a big square lined with restaurants with a fountain at the centre. We ate and drank in the sunshine and got to know each other better. It is precisely moments like this that make me love living abroad. I loved learning about each woman’s experiences and her opinions and plans for the future. We are each at crossroads at the moment, not sure of what we’ll be doing next, but enjoying the moment and appreciating this experience now. I loved finding common ground to laugh over and experiencing the realization that I’m possibly building more than a passing acquaintance. It’s a lovely feeling, friendship-building, and I hate that my time here is quickly coming to an end. After my lovely lunch, which included fois gras and duck proscuito, I went back home to take my laundry off the line. The sky was looking questionable as I walked and by this time I got home it started spitting. I got the laundry in just before the real rain came, skuppering my museum plans. It turns out it’s not such a big loss. Several of the other students have told me the Matisse museum is not worth it and that it only has one notable piece in the collection. Instead I worked on my enviro course assignment and French homework and then, in the evening, I went back out and met up with Marco, a student from one of the other classes, and we watched France lose to Mexico while practising our French. Although he’s in a lower class than me, Marco speaks really well (having the advantage of being Italian). I found myself bumbling and stumbling and resorting to simple, short “oui” answers with varying emphasis: “Ah, oui.” “Ouiiiii.” “Oh, OUI!” “Oui-eahh.” Ridiculous. On Friday, I thought I might try the museum anyway – and perhaps take part in another game of Petanque! 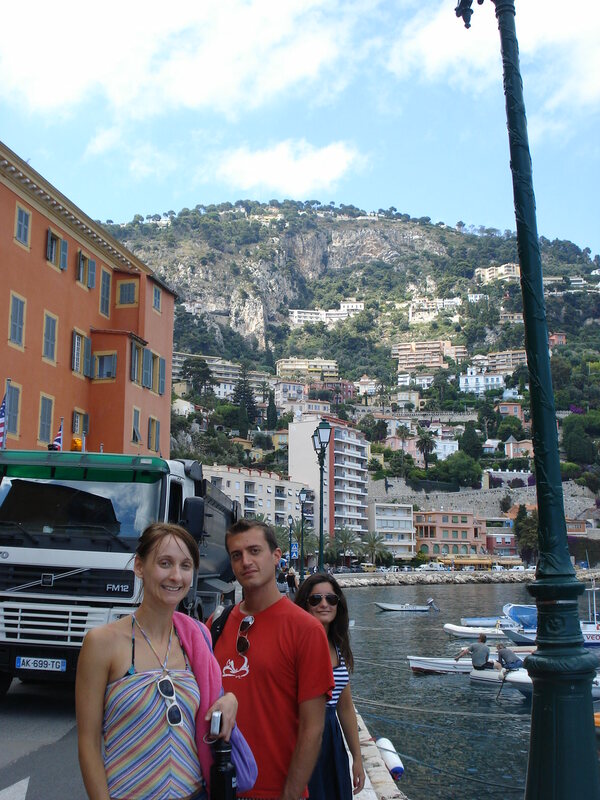 – but, once again, some other students invited me to join them on an excursion to Villefranche Sur Mer, a little town just southwest of Nice. The beach there is supposed to be nicer than Nice, with more sand than rocks. We took the bus, which travels high above this hilly coastal town, and then descended the tiny streets down to the beach. It’s a pretty little place, Villefranche is. We sunned on the beach, chatting away the afternoon, and then I headed back around 6 p.m. leaving the others to continue bronzing themselves (I really don’t need any more colour. I do, however, need a new bikini.) As I walked back through the town to the bus stop up in the hills, I stopped for a second and made myself appreciate what I was doing. 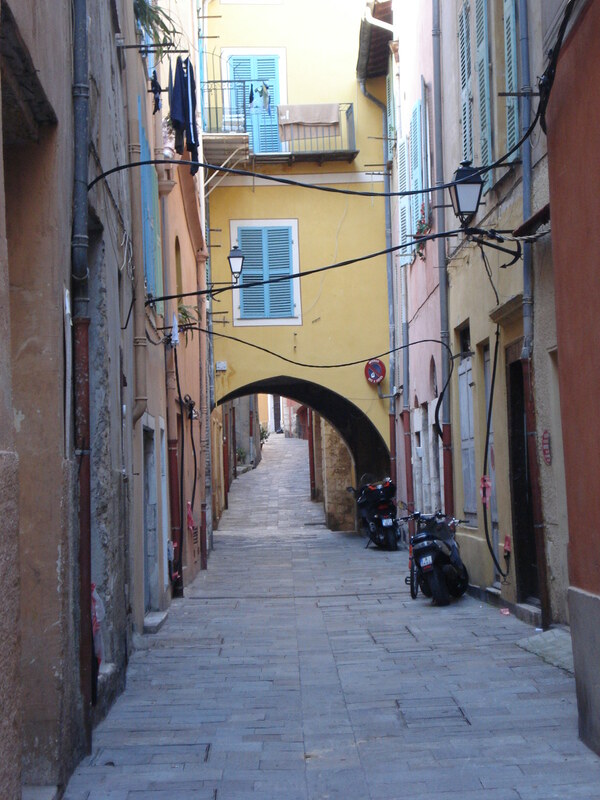 I was walking through Villefranche Sur Mer, a little village in the south of France–the south of France where I’ve been living for the past few months. To my left were the yachts and dingys of the super-rich. One of them might belong to Bono who has a house in VSM. To my right was a centuries old town, resplendent in corals, creams, pinks and blues. It’s easy to take these things for granted and I didn’t want to. Lisa, Marco and Natalia, on our way to the beach. 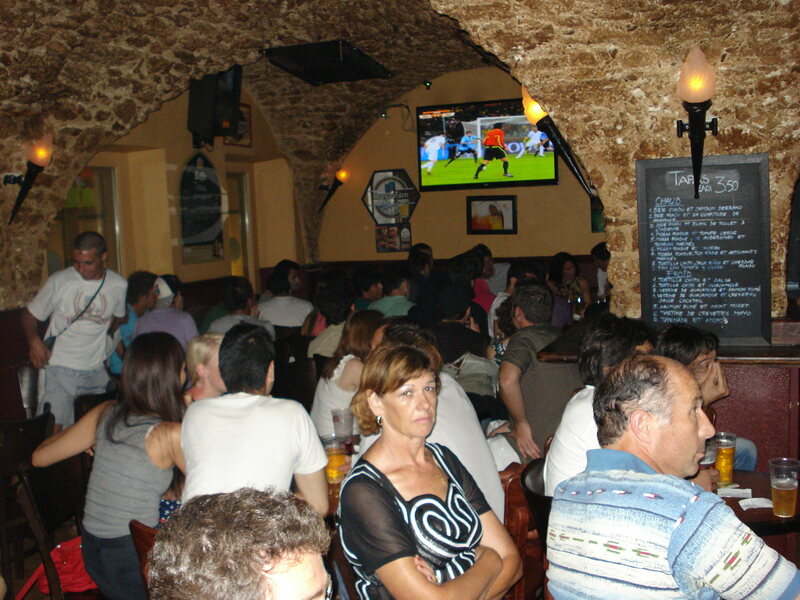 In the evening, I went down to Vieux Nice to watch England play Algeria. Our proximity to northern Africa means there are lots of Algerians in this part of France so many people were rooting for both teams. 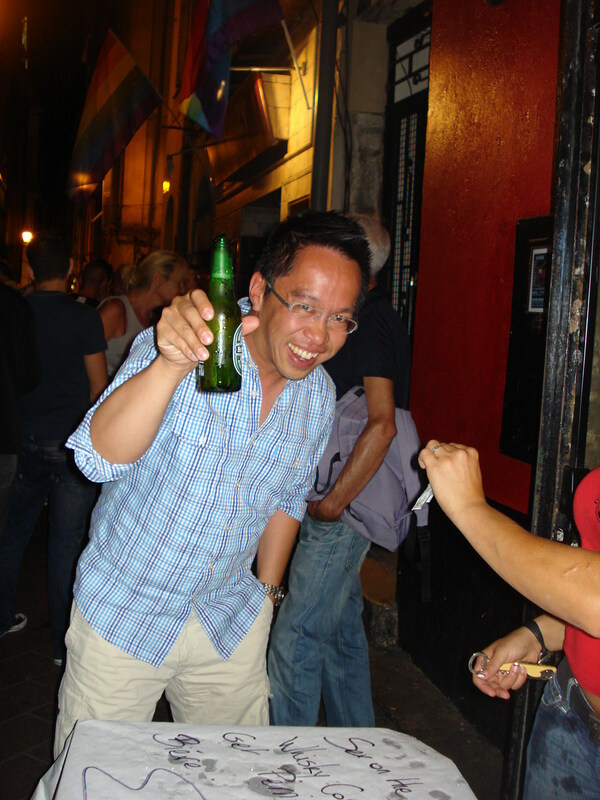 Vieux Nice was packed and the bar I went to was so crammed with people I thought they might not let me in. Despite being late, I managed to get a sweet spot with a perfect view of the television — one of the benefits of being one person instead of a group. England, the strong favourites, put on an embarrassing show just like their first game of the match, and the game ended in a 0-0 tie. Yikes. Earlier in the day, while we were at the beach, my voice started disappearing (in the next phase of this lovely cold of mine) and by Saturday morning, it was all but gone. I spent the whole day alone so I didn’t have to do much talking anyway, but I’d occasionally try to sing along to my iTunes just to amuse myself at the discordant cracking. I went for a long rollerblade, did more laundry, worked on the essay, cleaned, procrastinated and, in the evening, went out to a small bar and watched Cameroon lose to Denmark in a fine showing by both sides. THAT was a fun game. Ordering my drinks with no voice was also quite amusing. After the game, I treated myself to a big ice cream cone to soothe my throat and then headed home. I was on my way to sleeping well for the first time in a week or so when my left arm started itching like crazy and woke me up at 3 a.m. I realized that a mosquito had somehow got in and had had a field day on my arm. I had about five bites that were swelling grotesquely. I threw on the lights, jumped out of bed and spent the next 20 minutes poised to kill the little bugger. After a couple of failed attempts (and it managed to bite me AGAIN on the thigh! ), I spotted it on the wall near the ceiling and brought a swift and bloody end to its parasitic life. Let that be a warning to all of you mosquitoes far and wide. After finally falling back to sleep, I woke to thunder and lightning this morning. Unusual. 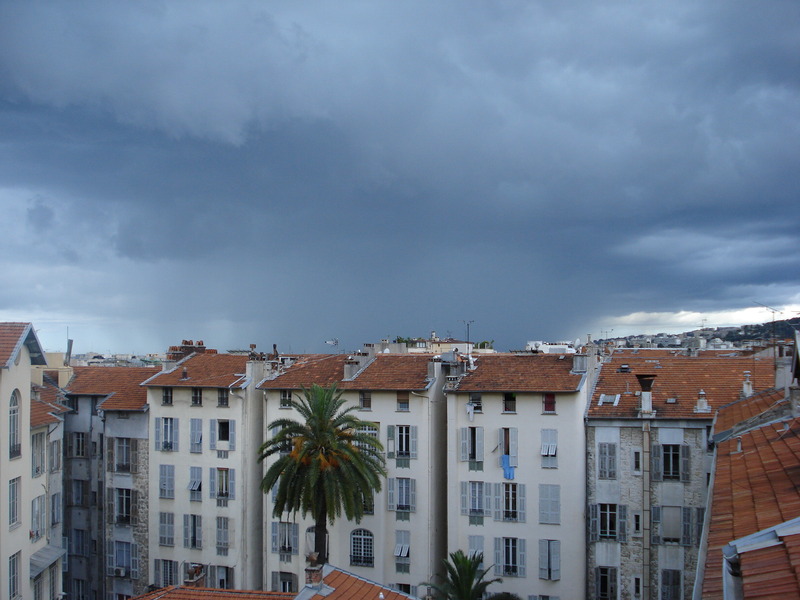 I opened the window and the skies above me were bright, but in the distance, over the ocean, was an ominous black cloud and I could see a column of grey rain falling from it. It didn’t seem to be advancing or retreating and, from the safety of my window, I watched the shards of lightning crash down from the clouds and listened to the cracks of thunder seconds later, as if an angry afterthought. My pictures never do anything justice. Sigh. It was darker and more ominous than this. In the afternoon, I met up with Lina, Fed and several other Italians to watch Italy play unimpressively against New Zealand. Actually, to be fair, Italy put a lot of shots on goal, but the NZ keeper was fully on his game today. I ate like a horse at the pub and wandered home slowly digesting after the game. 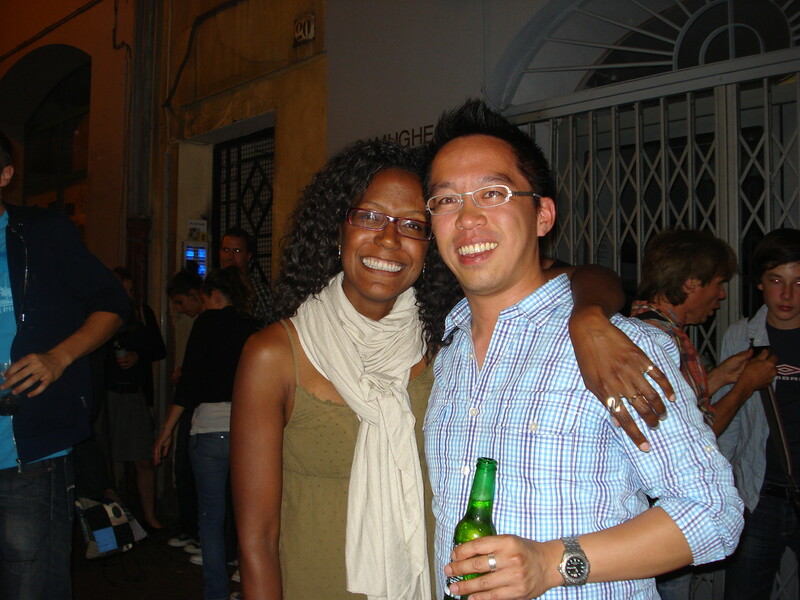 So it hasn’t really been much of a Nice-centric final weekend in Nice, but it’s been good nonetheless. I am sick. I blame Leon. I woke up yesterday morning with a sore throat. It’s been pretty dry in the apartment the last few nights so I was hoping the soreness was just the result of that and would be cured by a nice cup of tea or something. As pleasant as the tea was, the pain persisted with the requisite troubles swallowing and a mild headache to boot. Ugh. I hope this doesn’t last. After the game concluded, I slept the sleep of a sick person – fitful, sporadic and ultimately not as fulfilling as one would like – so I decided not to go to class today and just let myself rest as long as I needed. It’s sunny again today but I think I’m going to take it easy, nurse my little headache with happy thoughts (the throat is on the mend – free of wine for 24 hours, the happy protective bacteria have returned!) and do my environment essay. Leon’s plane was due to arrive at 10:10 p.m. and the last bus leaves for the airport at 9:55 p.m. so I made sure I was at the stop 10 minutes in advance. Apparently, French bus drivers don’t adhere to the schedule because the bus never came. This was a problem because Leon did not have my address and I wasn’t sure if he had my phone number either. Thus ensued a rather comical/frustrating series of unanswered texts and voicemail messages from me to him, texts between me and my friend Petra who would then post the information to Leon’s Facebook page (in the event that he somehow had access to that but not his phone service) and me walking back and forth at night from my place to the train station where the bus stop is located. Eventually, after still not hearing from him, I gave in and took the $90 taxi to the airport (if the bus had arrived, it would have been $1.30. Grrr) and Leon, his dead cellphone and I were reunited. On Sunday we walked the entire city and I felt so happy that Leon was as appreciative of Nice as I am. 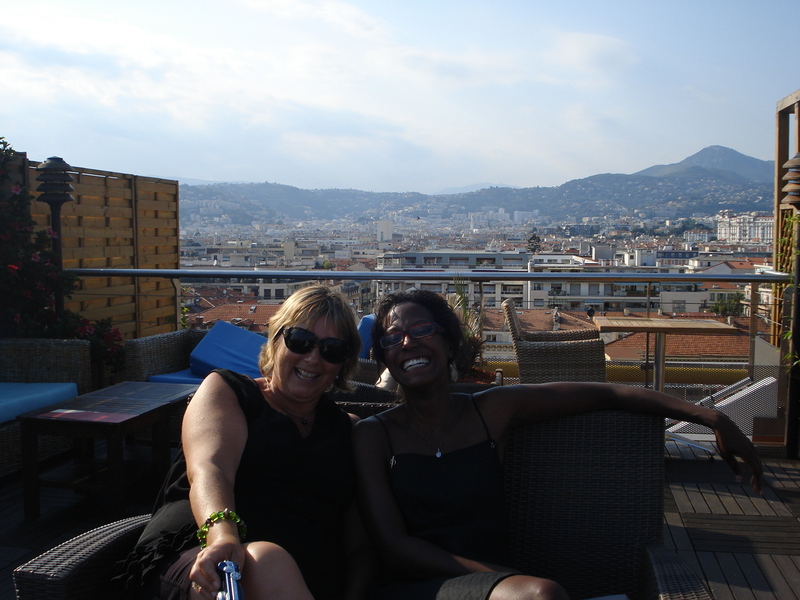 We went to the beach and through Vieux Nice, up into the hills and basically earned the big lunch and dinners we had. 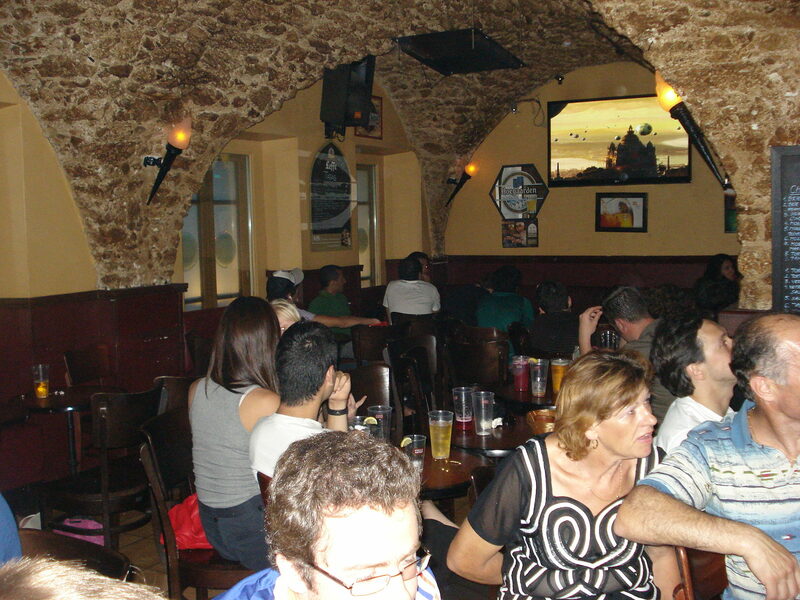 In the evening we went back to Wayne’s bar to watch the Australia vs. Germany football match. It was a bit of an evisceration, with Germany just slapping the Aussies around like they were amateurs. The band that I had met on Friday was playing again so we watched a bit of that. The bar wasn’t nearly as full but the kids still all ended up dancing on the tables again. 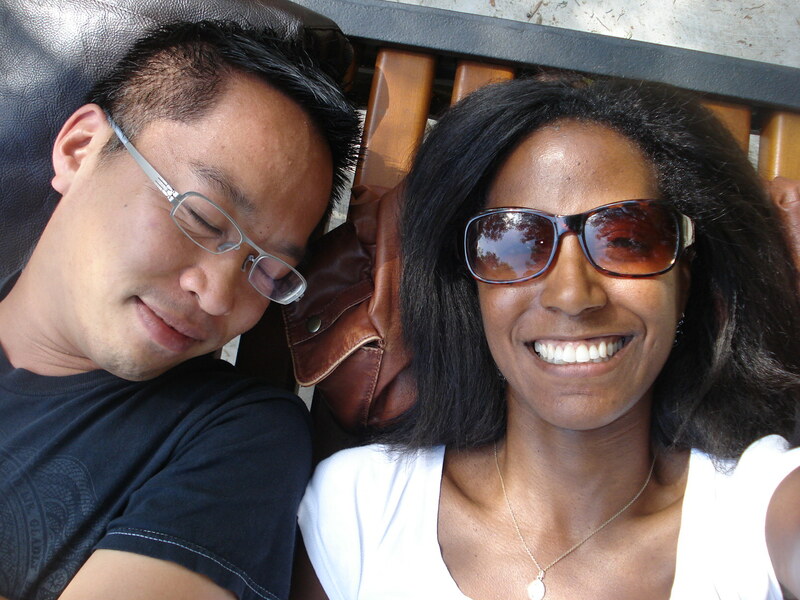 Leon and I take a little break lying on a park bench in the hills. A cute young guy standing next to us began talking to Leon and I (but mostly Leon). We were both individually trying to assess whether he was straight or gay but we never figured it out. I was hoping he was gay and kept trying to give Leon opportunities to talk to him. I think Leon was doing the same for me. Either way, the guy was very, very nice and Leon and I were both idiots. We never asked his name and when I suggested we go outside to get some fresh air, we didn’t invite him. I just figured he would come along (or maybe I thought Leon would suggest it because he’d been talking to him more, I don’t know.) At any rate, we left him and then he came out a few minutes later and said he was going home. When he was gone, we debriefed and decided that we are idiots when it comes to men. 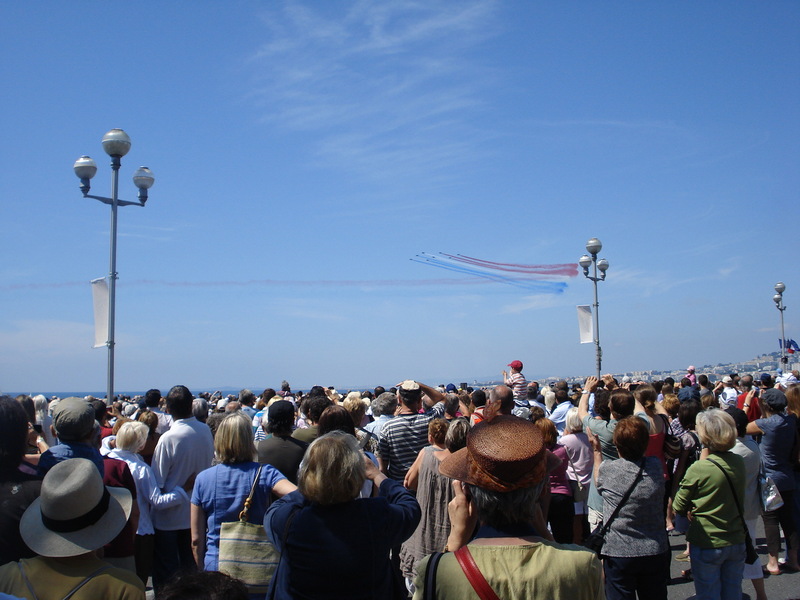 Monday was the culmination of four days of celebrating the 150th anniversary of Nice. 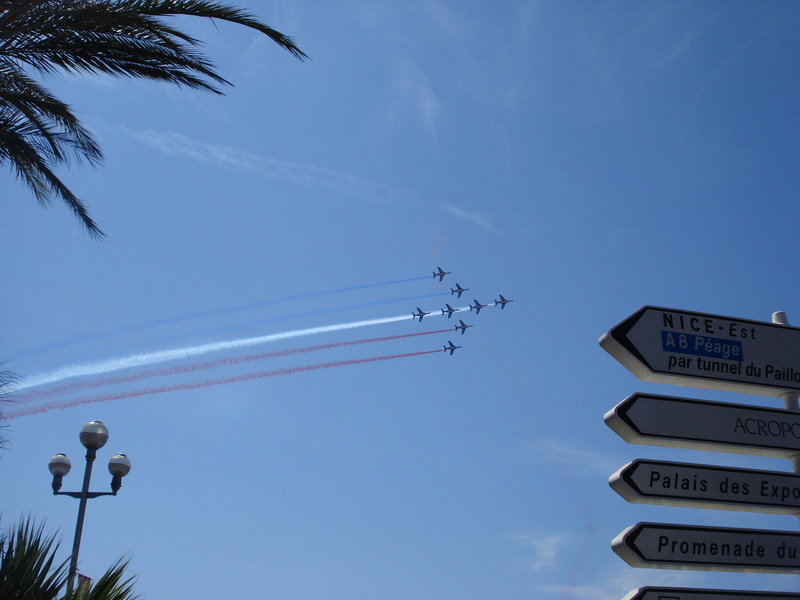 Apparently, Nice was one of the last regions to join France (which might explain why the guy in the bar was adamant that he wasn’t French… but dude, it’s been 150 years, give in already.) 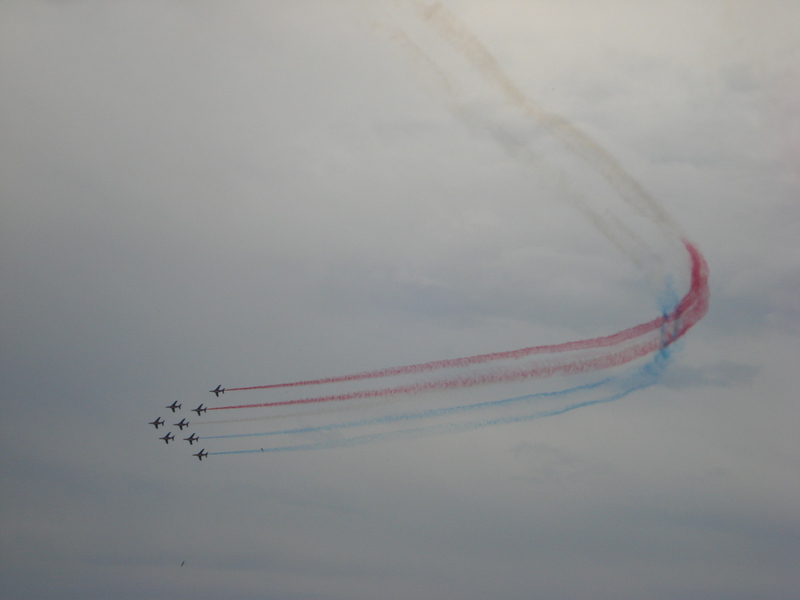 Our teacher took us on a field trip to the water to watch the air show, which explains why I had seen planes practising last week. 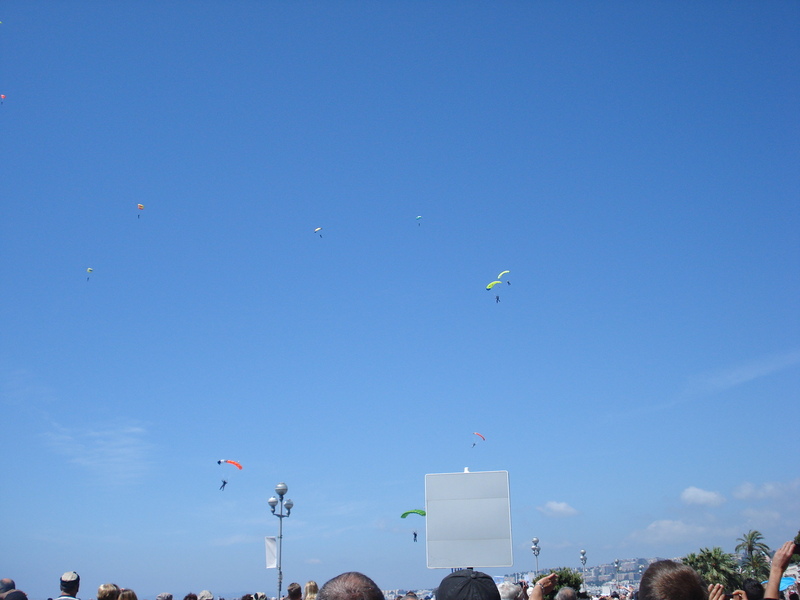 When we got to the beach, it was PACKED with spectators and we arrived just in time to see about 35 parachutists falling from the sky. The first one to land scared the crap out of me because he looked like he’d lost control, but then subsequent parachutists landed in similar fashion so I figured that’s just how it’s done. 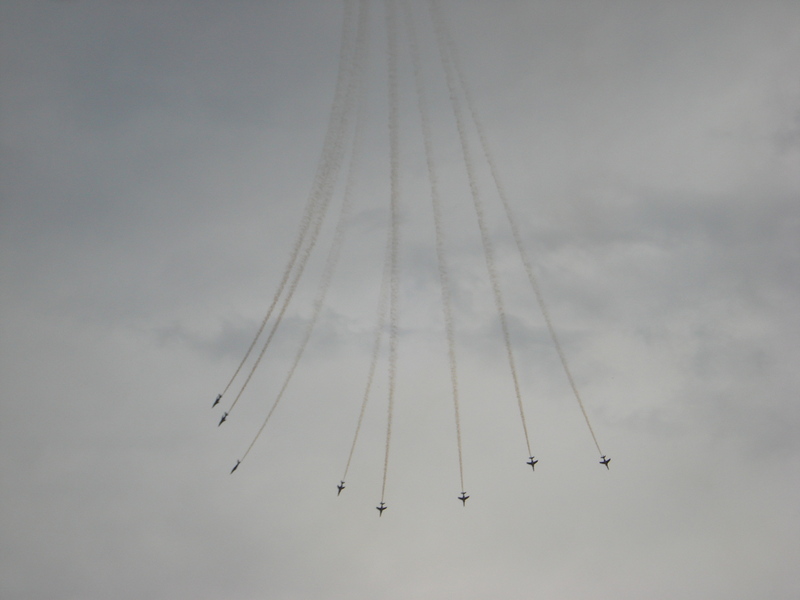 Then the jets took off. It turn out that the fighter jet team is led by a woman, which I thought was pretty cool, and they play bits of her commands over the loudspeakers in between the commentator’s information about the celebration and the air team. The commentator was funny, instructing us to be impressed and to applaud. Some of the parachutists prepare for landing. 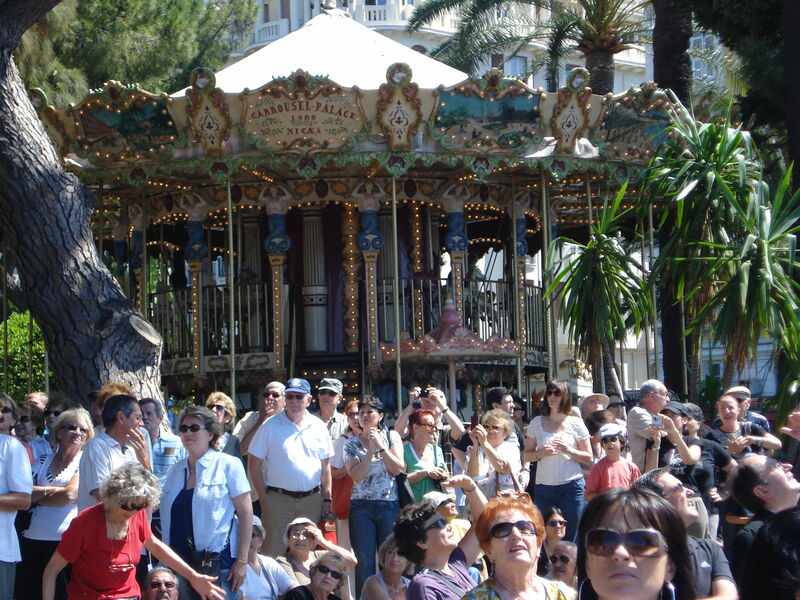 Spectators in front of a random carousel - a requisite for French cities. 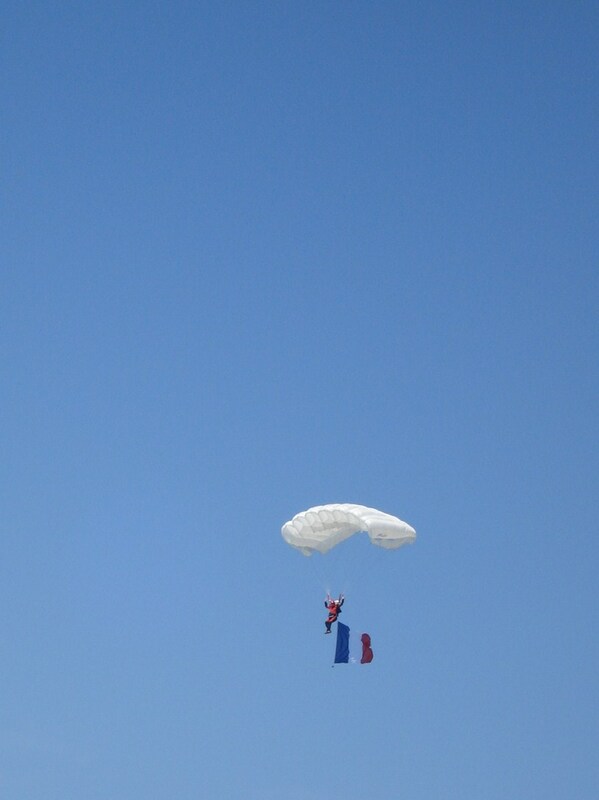 One of the parachutists flies a French flag behind him/her. They felt so much closer than they look in the picture. After the air show, we made our way back home because we both had to work and then went for a long walk in the evening (a necessity for me when I’m around Leon because he forces me to eat almost as much in one meal as I would in an entire day on my own and to drink about four times as much wine. I don’t think I ever want to eat or drink again.) In the evening there was a fireworks show but unfortunately we were in a restaurant and could only hear it. I’m sure it was spectacular though. For those of you living under a very unexciting rock, the World Cup began on Friday (well, Thursday with the opening ceremony). The most important tournament in football/soccer is taking place in South Africa this year, which is the first time it’s been held on that continent. Very big stuff. And those of you who know me or have been reading this blog since back in Sri Lanka know that I enjoy playing and watching soccer so I’ve been very excited for the games to begin. I also figured it would be a good opportunity to mingle with more locals. France was playing against Uruguay on Friday night so I decided to go down to the market area where I’d been told there would be big screens and lots of people. Sure enough, virtually every restaurant was broadcasting the game (except one, which proudly had a sign out front that said “No Game, Just Eat!”) I figured it might be hard to find a good seat so I went down to the market early – around 5:30 (game started at 8:30). It was surprisingly not that busy yet. The South Africa vs. Mexico game was still going and I accepted the invitation of one maitre d’ standing out side to watch the game on the patio of his restaurant, which was empty except for one super handsome guy watching the game. I sat and ordered a Campari (making the same mistake I make every friggin’ time. I always mix up Campari and Cinzano – love the latter, don’t like the former and always accidentally order it. Grrr.) I ended up chatting with the smokin’ hot guy who was from South Africa and was visiting his friends here with his girlfriend. Everyone was down on the beach but the guy felt that he should really check out the game. We rooted for South Africa together, which was up 1-0 when I arrived but Mexico tied it up at 82 minutes or so (of a 90-minute game). His friends and girlfriend arrived then, and it turned out that the friends were a British band who was playing that night at a bar called Wayne’s. I haven’t been to Wayne’s but it’s one of those “everyone of a certain age who comes to Nice knows Wayne’s” kind of place. It’s a backpacker haven. The friends and girlfriend were super nice and I quickly developed a teeny-tiny crush on the super-cute bilingual drummer (the girlfriend’s brother). They said I should come by Wayne’s later so I said I’d try. They left and my friends Lina and Fed arrived a few minutes later. We met up with another Thai/French couple, Ki and Def, and the five of us found a bar where we could watch the game and eat. We had perfect seats and the bar soon filled up and became very lively. Unfortunately, the people who sat next to me were Spanish so there was no practising French for me. 😦 But I did get to join in with the crowd singing a rousing version of Le Marseillaise, the French national anthem. I learned it in grade school and was hoping I’d get to use this otherwise useless knowledge on this trip. Yay! Def, Ki and Lina. 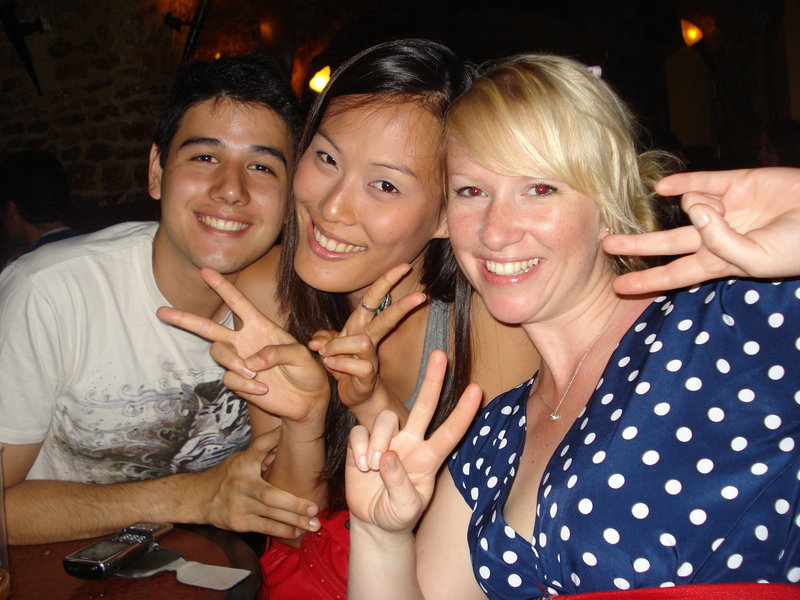 Ki says all the girls in Thailand always make peace signs in pictures. The game was kind of boring with only a few really threatening attempts at goal on either side. It ended rather undramatically with a 0-0 tie. I was very amused at half-time when about half the restaurant got up and went outside for a smoke. ... and during the break. Even with the tie, the French spirits were still quite high and as we poured into the streets, there was still a festive feeling all around. Some of our classmates had texted that they were at Wayne’s (what a coincidence) so we headed over there. I went inside and the band was already underway in the back room. They were pretty good and room was insane—a total drunken university vibe with everyone dancing on the tables. 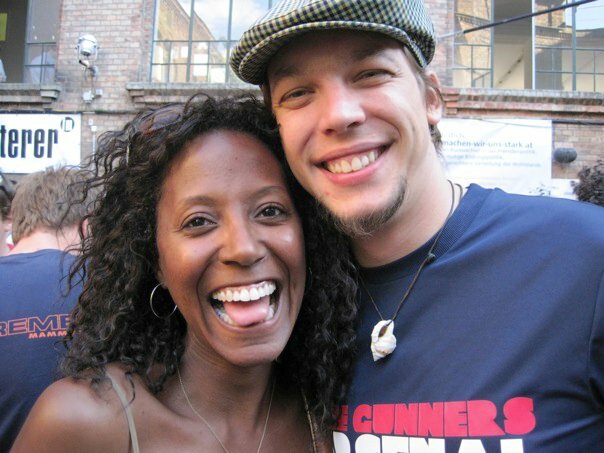 Sigh… I miss those days. I said hi to smokin’ hot guy and his girlfriend and gave them something they’d left at the table at the other restaurant and then went back outside to chat with my classmates. We came back in and watched the band for another half an hour or so and then went back outside to escape the heat and increasing claustrophobia. Before more and more people came in. You can't really tell but people's heads are brushing the ceiling. 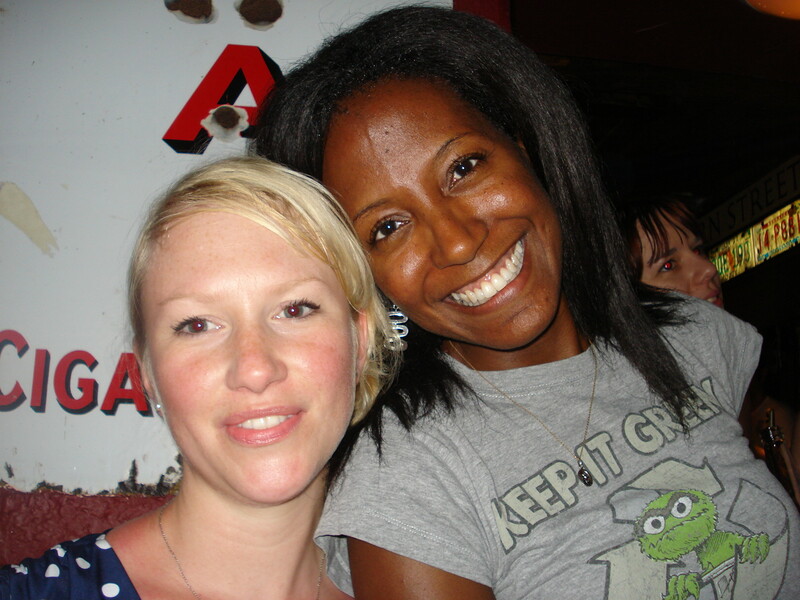 Lina and I sweating in the bar. In class a few weeks ago, we learned the term “insolite” which means unusual. Today had a bit of the unusual happening. During our break from class, everyone was outside chatting (and the smokers smoking) when a seagull landed on the sidewalk with a pigeon in its mouth! We all watched in quasi-horror as it jumped onto the hood of a car and began savagely shaking the pigeon corpse in its beak. I don’t know what it was trying to do but I couldn’t watch as feathers began to fly from the lifeless bird so I had to go inside. Much to my chagrin, it appears that my body prefers to sleep during the day than in the night, so I once again had a nap. It wasn’t as successful as the day before – probably because of the loud wind — but I did get a bit of shut-eye. When I woke up around 4 p.m. I walked over to the computer and glanced out the window. 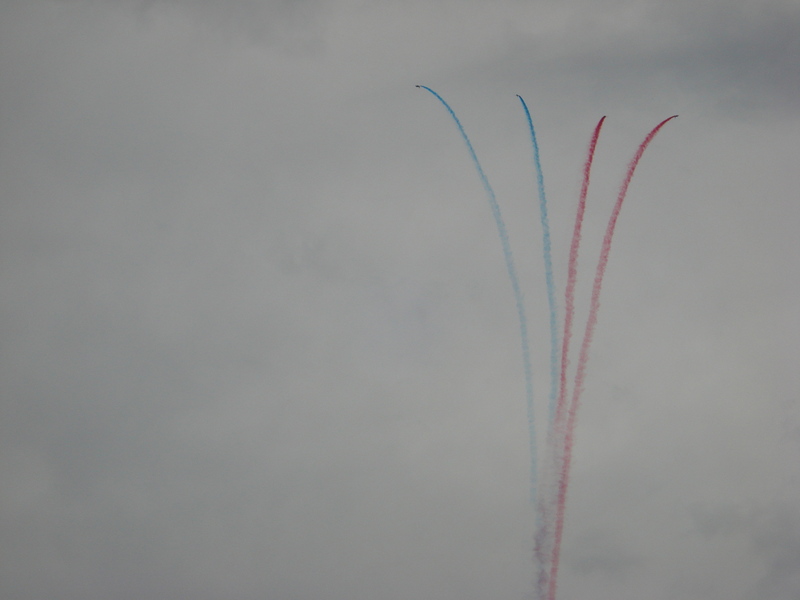 The wind had completely died down and I realized that the noise that I’d assumed was still wind was actually an air show. I love being at the top of this building. It always provides such visual treats. I could see people on the lower floors craning to see what was making the noise but from their angle on the opposite side of the courtyard you couldn’t see anything. I popped over to the grocery store and, as I stood in line, I realized that there are no express check-outs here. Everyone just waits forever to pay for things. One of the women in front of me actually paid with a CHEQUE, so of course that took forever with the two pieces of ID and all that. No one seems fazed by this. On the way home I passed an elderly woman who had painted her face completely red – not in support of a team or anything like that, she just seemed to have used her rouge as foundation and then had her other make-up (similarly garish) on top of that. To each his own. When I left, I passed “The Brazilians”. There is this troupe of Brazilian buskers and I swear they are following me (okay, not really but I run into them EVERYWHERE). They do their acrobatics and singing and dancing and then ask for money. At this point I just avoid eye contact and walk on. That’s basically it for my day. Apparently there is a jellyfish infestation down at the beach right now but it is hoped that the wind will send them back out to deeper water.